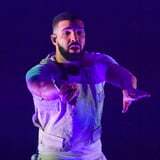 Get the Full StoryFor fans who attended Drake's recent tour, it seems there will be plenty more social media moments where that came from. The rapper is rumored to be in the process of finalizing a residency at the Wynn resort's XS Nightclub in Las Vegas. According to the Las Vegas Review-Journal, Drake told the audience during a recent appearance at the club, "Vegas! When I came back, I thought it'd be back at T-Mobile Arena." He added, "But I'll be back here at XS all year. You'll have a lotta chances to see me." Drake has since continued to drop hints, even captioning a photo from the appearance, "New home." He also tagged Wynn Las Vegas and XS Nightclub in the post. Though it's certainly big news, Drake isn't the first rapper to have a Las Vegas residency: Pusha T, Big Boi, and T.I. are among the few who have landed residencies recent years, and Snoop Dogg was actually the first hip-hop artist to do it in 2014. That being said, it's still rare. Artists like Frank Sinatra and Liberace popularized the idea of a concert residency in the 1940s, while Celine Dion and Elton John found massive success with their residencies in the 2000s. The model has gradually become less associated with the twilight years of an artist's career - as evidenced by Lady Gaga and Gwen Stefani's ongoing residencies. If the rumors are true, it looks like they'll have some more company soon.